The Royal Canadian Yacht Club Youth Sailing program provides the opportunity to experience the sport of sailing in a safe, fun-filled, challenging environment. While competitive excellence in sailing is recognized & encouraged, the fundamental objective of the program is to introduce and nurture the love of sailing! The Toronto Islands, apart from being close by, are endlessly fascinating. That they even exist—a natural setting with one of the best views of the Toronto skyline—is fantastic in and of itself. The Royal Canadian Yacht Club, one of the premiere, oldest, and most traditional clubs of its kind in the country, is a jewel in the crown. Just going there—setting out by ferry each day of a camp session—is, quite rightly, for many kids part of the thrill. To engage within the club environment just continues a theme. It's a unique, stellar opportunity to work with others improving skills, indulging passions, and engaging people of like interest, taste, and outlook. For the right child, each day of a camp session at the RCYC is full of pinch-me moments: great instruction, great views, and lasting memories. As Chair of the Royal Canadian Yacht Club’s Youth Committee, I invite you to join one of the premier youth sailing programs in Canada! 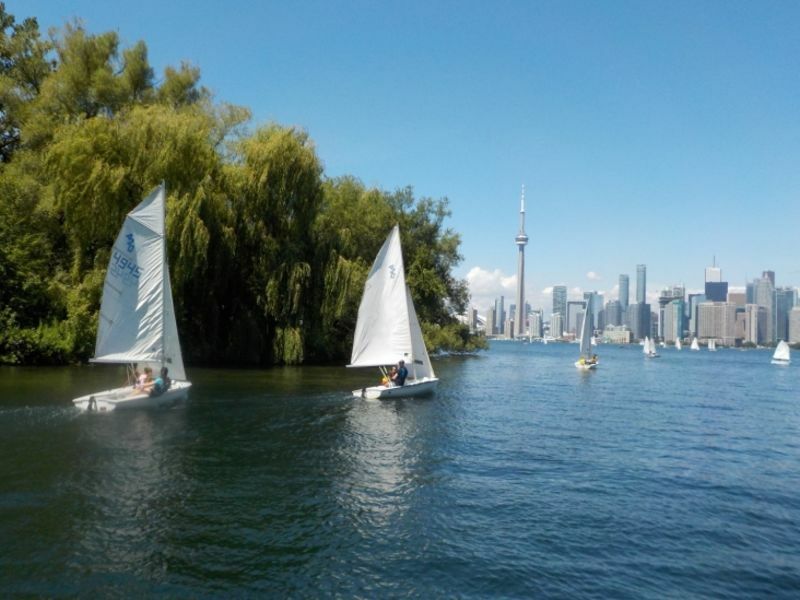 Located at our Toronto Island facility, RCYC Youth Programs are a wonderful way for your child to learn sailing fundamentals at our vacation home in the city. Our location provides the feel of being at a cottage but only a 15-minute private ferry ride from home. The Royal Canadian Yacht Club takes great pride in our Youth Programs. Our youth are the future of our Yacht Club, whether producing Olympic or International racers or lifelong members with a love of sailing! RCYC Junior Club has been providing youth sailing instruction for over 75 years—so we know what we’re doing! Our sailing school supports learn-to-sail programs through to competitive dinghy racing for ages 7-16 and are taught by CANSail certified instructors. We offer a safe learning environment for all with small group on-water sessions in various types of sailboats. Off-water activities include swimming, tennis and Friday BBQs on the beach. We are sure to have a program that will create a magical summer of sailing for any participant! If you have questions on which program is best suited to your son or daughter, please do not hesitate to reach out to Dan Cunningham, Director of Sailing, or Lauren Laventure, Head Coach, and they will be happy to help you with your choice for the upcoming season. Personally, my summers spent as part of the RCYC Junior Club were some of the best of my youth and provided me the skills to travel the world racing sailboats. It is the reason I love sailing and racing today. I hope that your experiences as part of the RCYC Youth Programs are as great as mine were. Interested in Royal Canadian Yacht Club?